I was pleased to read this. What precisely it means may not be entirely clear, but I'd hope to be reading it right if I assume that somebody will finally be looking into the curious case of Stephen Crockett - which, when all is said and done, is all these pieces have been asking for. 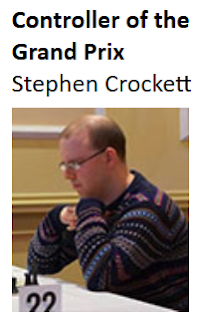 I'd also hope that from here on, suspicious sequences of results will be reviewed as a matter of course, as proposed in that same English Chess Forum thread that first brought to my attention the name of Stephen Crockett. This would be a vast improvement over the previous system of looking the other way, not to mention the recently-adopted procedure of responding to complaints by making the individual complained about controller of the Grand Prix. That appointment kind of complicates things a bit, but still, better something than nothing and better late than never. That said, if only somebody had done this five years ago. It might have saved an awful lot of fuss and bother later on. There's a fair few suggestions on that thread about what English chess should do about sandbagging, to which we might add "try and find out how widespread we think the problem is". We're not likely to come to a view unless we try to find out, are we? But it's not the first time that there have been claims of this nature - as I wrote, a few weeks past, and some years ago. Well, at least somebody took some action against somebody, you might say. Or you could say, if you looked through the half-full glass the other way, it's amazing what some people in chess think they can get away with. But what is Andrew Horton-Kitchlew doing in chess these days? He, too, was a contender for the Grand Prix in his day. Last I heard he was still winning Challengers events, after all these years, albeit a long way away from Leamington Spa, which was the only place I ever met him over the board, who knows how long ago, 1990 or something. It was a rapidplay, a challengers event. He probably won it. I certainly lost the game. Allegations of sandbagging accompanied Andrew Horton-Kitchlew around the circuit for years and years. For far too long, really*. Maybe congress organisers didn't see the need to act when federations hadn't acted. Maybe federations didn't see the need to act while congress organisers kept accepting the player's entries. There were plenty of good reasons. And plenty of bad reasons, since there's always more than enough people in chess who don't give a damn about sandbagging or anything else, if it's their mate involved. (Horton-Kitchlew always had a lot of mates like that.) Or people who simply, whatever the problem, just don't want to hear about it - as long as it's not them affected. Which is kind of why English chess, as a community, is never likely to get out of its habit of hoping problems go away, and get into a better one, of dealing with problems when they actually come up. It might save an awful lot of fuss and bother if we did, don't you think? Do you think we ever will? I see it more as a threat rather than an investigation to be honest. Is the blog intending to comment on the outcome? He has resigned his position as Grand Prix Controller and announced an ambition to reach 160. He'll have to cut out all those results where he gets 0 or 1 out of 5. I am sure you are aware that Stephen Crockett has now resigned, but has said he was cleared by the investigation. I suppose you will write a follow up or final blog on the subject. I doubt you will be surprised that I don't entirely agree with you, and I understand the deal. But still I would be interested to hear your view on whether we should be applying "balance of probabilities" or "beyond reasonable doubt" in such circumstances. I think the latter, and on that basis, that surprising statistics are not enough. Depends on who or what constitutes "we", really.